The Smurfs (Les Schtroumpfs) are a fictional group of small sky blue creatures who live in Smurf Village somewhere in the woods. The Belgian cartoonist Peyo introduced Smurfs to the world in a series of comic strips, making their first appearance in the Belgian comics magazine Le Journal de Spirou on October 23, 1958. 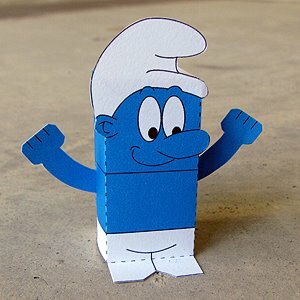 The English-speaking world perhaps knows them best through the popular 1980s animated television series from Hanna-Barbera Productions, The Smurfs. Nice! I just came across your blog with the stumbleupon toolbar and gave you a thumbs up! Your blog is so well written and very attractive - I have a lot to learn. Please visit my blog about WDW Auditions if you get a chance. Thanks and best of luck with your project! Hiya, are you still doing 1 a day ? or are you on vacation ?